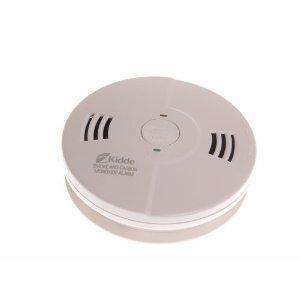 The Kidde 0122UK smoke and carbon monoxide alarm is a fantastic provider of peace of mind for you and your family. A loud voice alarm warning system will tell you if smoke or carbon monoxide has been detected, eliminating any confusion whether it’s a smoke or carbon monoxide (CO) danger. The Kidde 0122UK has extra-sensitive state-of-the-art electrochemical technology for carbon monoxide detection, with ionisation technology for smoke detection. Ionisation alarms are quicker at detecting fast flaming fires, giving you a faster response time to the alarm and providing vital extra seconds in the event of a fire. The Kidde 0122UK has a unique test/reset button that allows you to verify alarm operation. Included on the 0122UK is a low-battery indicator, where a built-in voice announces low battery and the red LED flashes for battery replacement. This Kidde smoke and carbon monoxide alarm comes as an easy-to-install kit with instructions included. Kidde Products is a leading manufacturer of advanced fire protection equipment, comprising some of the best known and most trusted brands in the fire industry. Its products range from the latest fire detection and alarm technology, through engineered fire suppression systems, to hand-held fire fighting equipment.